Home World US-Turkish tensions rise over the plan to withdraw troops from Syria. New tensions have arisen between the United States and Turkey after Trump’s National Security Advisor, John Bolton, met with state officials in Ankara on Monday to discuss details about the US withdrawal from Syria. Tensions first erupted after Bolton said the US retreat was conditional on the safety of US-backed Kurdish fighters – a group who Turkey regards as terrorists. Bolton traveled to Ankara seeking assurance that when the US pulls its 2,000 troops out of neighboring Syria, the Turkish will not attack Syrian allies of the US on the ground. What he received instead was a big snub. Turkish President Erdogan, who refused to meet with Bolton personally, said, “No one should expect us to accept or swallow national security adviser Bolton’s comments.” He insisted that there was no need to meet with Bolton when he could speak to Trump at any time on the phone. The Kurdish People’s Protection Units (YPG) has served as the primary proxy ground force for the US intervention inside of Syria. For a long time now, Turkey has condemned Washington’s military relationship with the Kurdish YPG in Syria because of the group’s ties to the banned Kurdistan Worker’s Party (PKK) in Turkey. 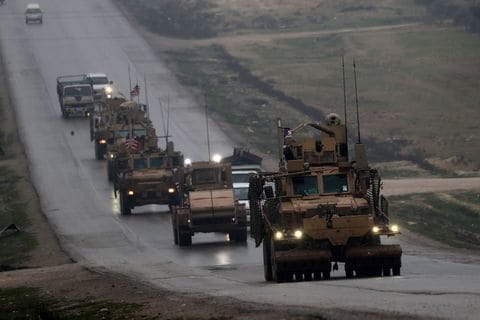 Trump first announced US troop withdrawal in Syria on December 19 after a telephone conversation with Erdogan but has since backpedaled, stating that the removal would be made cautiously over a more extended period. Meanwhile, the Syrian Democratic Forces, an alliance of Arab, Kurdish, Assyrian/Syriac, Chechen and Turkmen forces who have participated in the Syrian civil war, feel betrayed by the US – calling the withdrawal a “stab in the back.” Without US backing and support, they surely would be demolished by the superior Turkish military. Inside of the US, officials inside of both Republican and Democratic parties have denounced Trump’s plan to withdraw troops as an unacceptable geopolitical concession to Russia and Iran. Trump now finds himself in an awkward position as he will be unable to please everyone in this situation. Recent statements given by top officials from the Trump administration, including John Bolton, have suggested that the illegal presence of the US military in Syria, in some form, will continue for the foreseeable future. So, the quarter-century of continual war for hegemony over the oil-abundant and religiously fanatic Middle East doesn’t appear to be stopping anytime soon. Quite the opposite, as a broader regional and possible global conflict, threatens to erupt.